Fresh seafood, cooked meats, gourmet cookies, cheeses, oils, honey, preserves, marmalades, mustards, teas, coffees and much, much more.Sawers is a family business that has always prided itself on stocking an extensive range of quality foods. 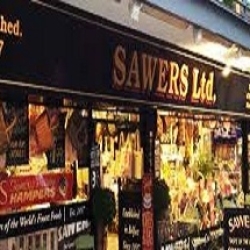 Established in 1897 Sawers is Northern Ireland’s oldest deli and is described as an “Aladdin’s Cave” of culinary delights. Sawers is as famous in Belfast as the Titanic & in fact supplied the R.M.S. Titanic with olives, cheese, game and much more for its onboard functions.As well as searching the globe for the best cuisine we also feel it is very important to find the best local producers and showcase their quality products.